Glaciers respond to climatic changes by gaining or losing mass in the form of snow and ice. Sustained climatic changes will eventually lead to glacier advance or retreat. 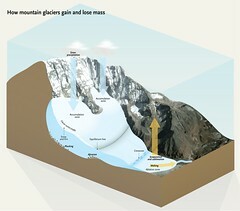 Glaciers in the HKH region are losing mass and retreating strongly. However, some glaciers in the Karakoram region have either been neutral or slightly gained mass in recent decades, with advancing or stable glacier fronts. The ‘Karakoram anomaly’, as it is now known, is the subject of intense scientific interest.